Day two of the project started around 11 AM. I now had power to the keyboard and was ready to try and get some sound out of it. I plugged it into my guitar amp, turned it on and...nothing. I was expecting that, actually. The rocker switches that provide the different sounds were stiff and didn't seem to be moving right. 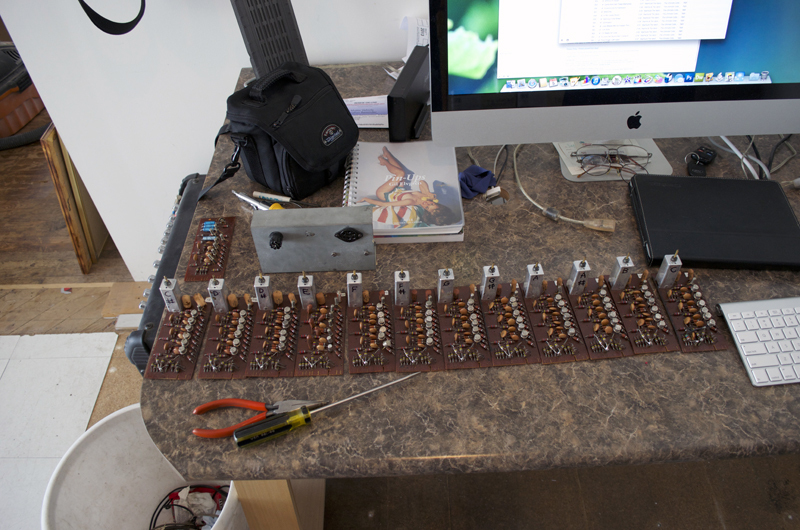 I lifted up the keyboard frame and removed the assembly that held the switches. 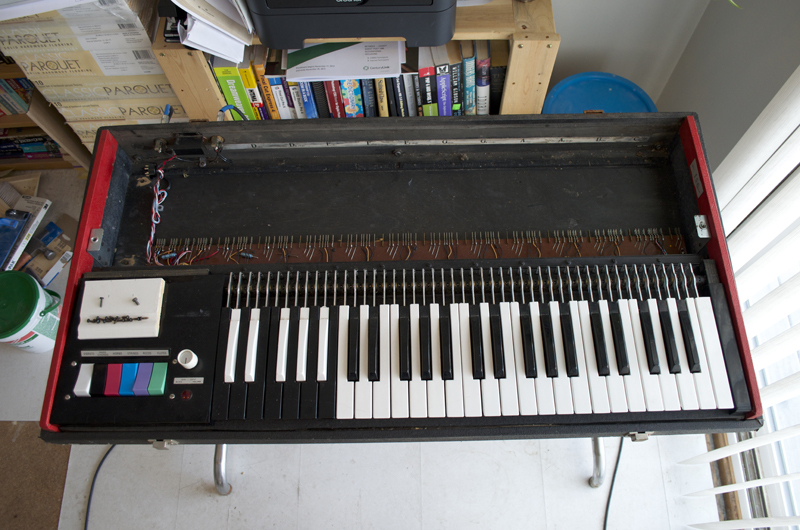 Once free from the keyboard frame they moved smoothly but still no sound. I checked the contacts and found that they weren't touching when they should so I ended up bending them slightly and that had us in business. With that done I reinstalled the switch assembly but found that, for whatever reason, the switches kept binding. Maybe years of hard playing did it, but it wasn't working. I ended up having to make some shims out of balsa wood (the lighter bits under the frame) so it would sit correctly. Now the rockers rocked, and the organ did too. Out of six switches all worked but one. Vibrato and Bass Chords work fine, along with Strings, Reeds and Flute (although Strings sounds kinda funky). Horns however is completely dead. 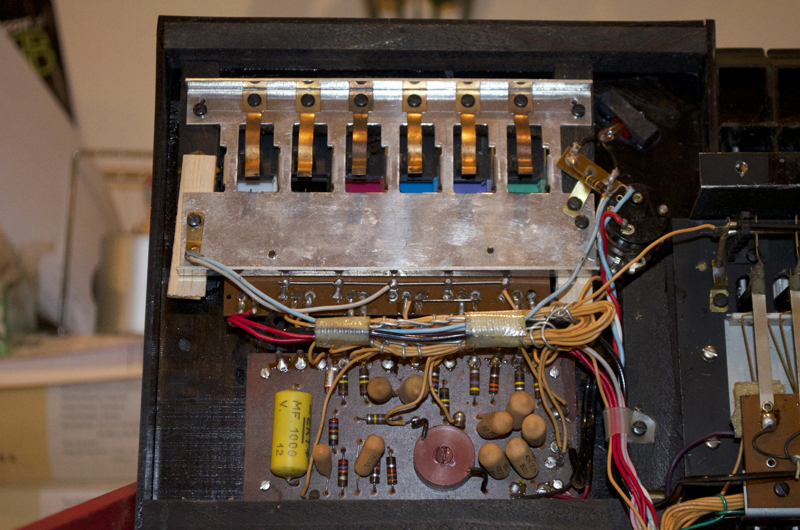 As far as I can determine the different sounds (not the tones; they're produced by the tone generators) are produced by the circuit board below the switch assembly in the picture above. That board is pretty simple however, with nearly all the components being pretty bulletproof. 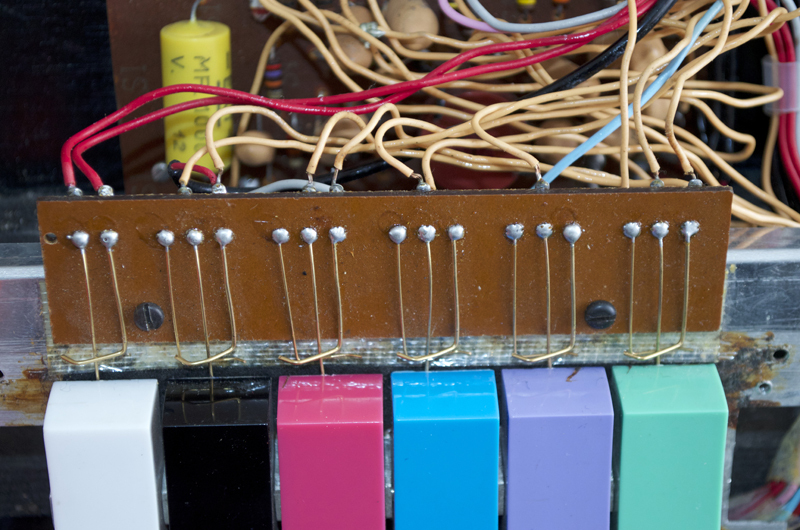 The only exception might be the big yellow electrolytic capacitor on the left. They're prone to failure over time and that one has got to be almost 50 years old. So I envision another trip to RaElCo (Salt Lake's best electronics parts store) to get another one and swap it out to see. I only had one other issue; a funky B flat tone generator but after I pulled all the generators out, vacumed and cleaned the contacts and reinstalled that problem solved itself.